The discussion that people made after answering this question was quite interesting, and thus the survey was born … But back to the question. 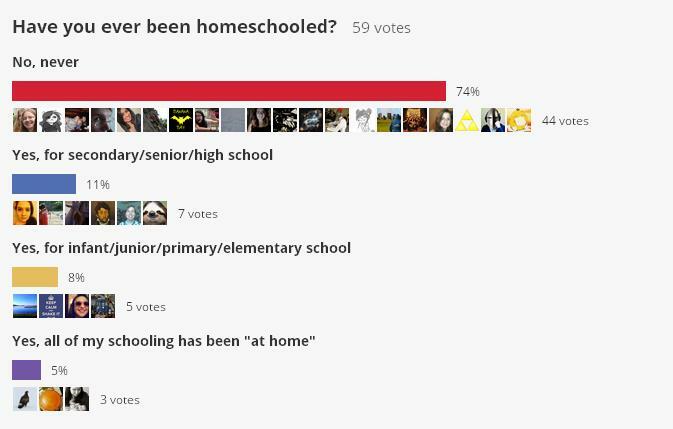 The first thing I noticed is that only about 3/4 of respondents had never been homeschooled. I thought it would be more like 95% – or maybe 90%; because the internet seems like a place you’d meet people if you’re a homeschooler. 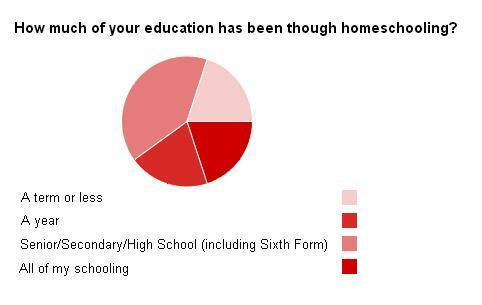 The survey then went on to ask people how much for their education had been done though homeschooling, and the results can be seen in this lovely red pie-chart. 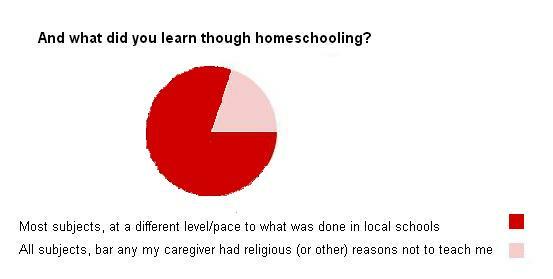 For most people, or 60% of respondents, Homeschooling was a long-term thing. Reasons for this where mainly to do with poor quality education at local schools, but living in a very remote location, college preparedness and parental working hours/lack of family contact if in a school setting were also mentioned. Because a lot of my local schools aren’t very good – until a couple of years ago, my town was officially the country’s worst school district – I totally understand why people might not want their child going to a school where people were violent/did drugs/were merciless bullies. The other 40% were only homeschooled for a year or less, with health reasons being sited as the main reason for this stop-gap style of learning. Although I’d been lead to believe it was the main reason people were homeschooled, absolutely no-one mentioned religion with regards to why they were homeschooled. As this next (admittedly slightly blurry) chart shows, most people who were homeschooled followed a reasonably normal curriculum. A different pace of education was mentioned by most respondents, something I can empathise with, only learning in year 12 that most primary schools don’t teach their students long division, something I had learnt about 8 years previously. The idea that homeschoolers read a lot was also commonly mentioned, as well as a more creative/hands-on learning experience. Because it’s something I heard about when originally asking if people where homeschooled – and something I briefly looked into when I misread something and thought I’d forgotten to take a certain A-level which I don’t actually need – the next section was on online schooling. 60% of respondents had been involved in this, presumably removing the need for a parent/caregiver who knew how to teach. Because of this reason (amongst others), there are countries – such as Germany, Sweden and The Netherlands – where homeschooling is effectively illegal. A couple of people also mentioned using online schooling to supplement their in-school education, be that though learning extra languages (I know the Welsh government provides online welsh-language schooling freely to it’s citizens) or bringing skills such as maths up to a higher level than is taught in the classroom. 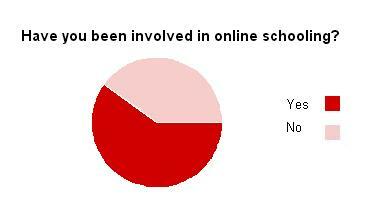 Finally, I asked if people would recommend a homeschooling experience, and the vast majority said yes. Reasons for this included flexibility, in when and where education took place – as well as being allowed to wear pyjamas. People also said that homeschooling improved one’s work ethic – but if someone had difficulty with self-discipline, it may not be very appropriate. As always, feel free to discuss these results, either here or at the survey’s original location. Another, possibly final, instalment will come in a fortnight’s time, but for now, Best wishes.